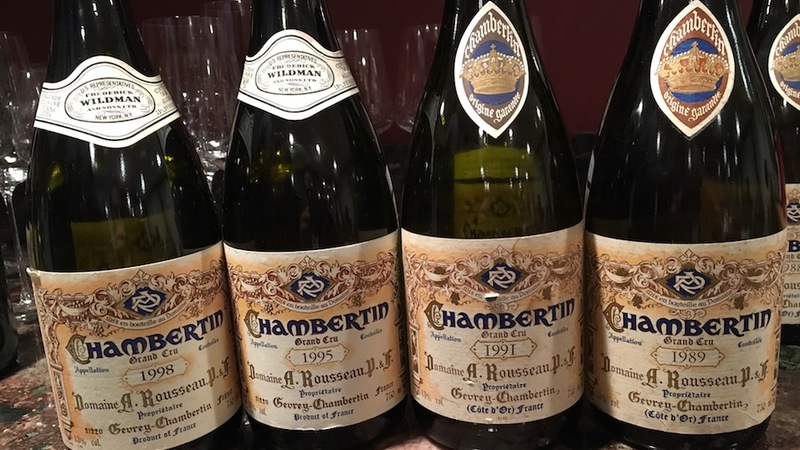 This tasting of Rousseau’s Chambertin spanned eleven vintages back to 1988. As so often happens with Burgundy, there were a few surprises. In this case, those surprises came in the form of several wines that were far more expressive and rewarding than the pedigree of their vintages might have suggested. With wine, but especially with Burgundy, it often pays to buy the producer first and the vintage second. 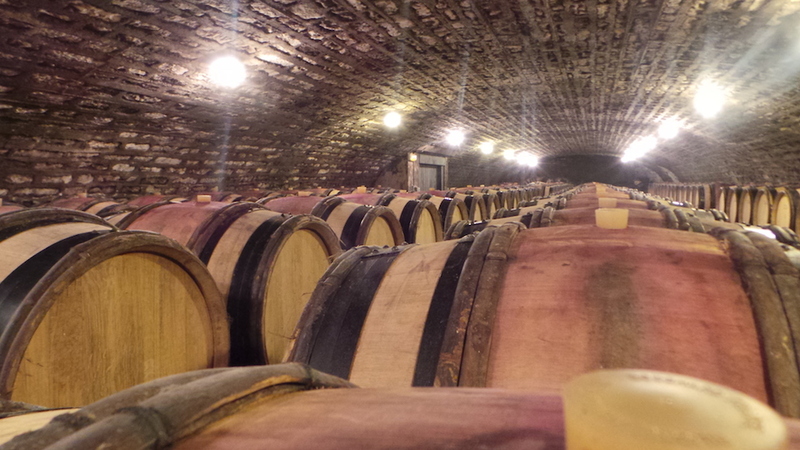 Rousseau is of course one of Burgundy’s most storied family-owned and operated domaines. The Rousseau family’s history and their vineyard holdings are discussed in more detail in this recent article. Rousseau's 2002 Chambertin is in the zone. Succulent, racy and open, the 2002 is ready to deliver pleasure. The purity of the fruit alone is striking. Even so, the 2002 is still very much at the early part of its first plateau of maturity, as the flavors remain very bright and fresh. In this vertical, the 2002 comes across as a wine of immediacy, with a bit less structure and overall energy than the very best vintages. I say that with some hesitation, as the 2002 is exceptional. It is just a little less exceptional than a few of the other wines in this vertical. This is the finest bottle of Rousseau's 2001 Chambertin I have ever had. With each taste, the 2001 has something new to say. At times, it is the aromatics that stand out. In other moments, the wine's structure, energy and overall complexity are totally alluring. Dark and brooding, with compelling inner sweetness, the 2001 simply can’t be denied. It is utterly profound. It is as simple as that. Yet another stunner, the 1999 Chambertin halts all conversation around the table. Muscular, dense and explosive, the 1999 is a vertical, imposing Burgundy that is also clearly built for the long haul. Even with all of its full-throttle, unrestrained power, the 1999 possesses captivating inner sweetness that soars out of the glass with remarkable purity. What a wine! The 1998 Chambertin is one of the real surprises in this tasting. From a vintage that never got much of a look, Rousseau's Chambertin is a pure and total delight. It is not the most complex wine in the vertical, nor is it the most pedigreed, but it is absolutely exquisite, as all of its elements are in perfect balance. The plum, sweet tobacco, menthol and red cherry flavors, along with the wine's soft, open-knit personality, make the 1998 impossible to resist today. Readers looking for a vintage of the Rousseau Chambertin that is peaking will find much to admire in the 1998. A wine of gravitas and virile power, the 1996 Chambertin is really something to behold. The flavors are dark, earthy and pungent. Readers will find a powerful, muscular Chambertin that - despite its twenty years of age - appears to still need time to be at its very best. 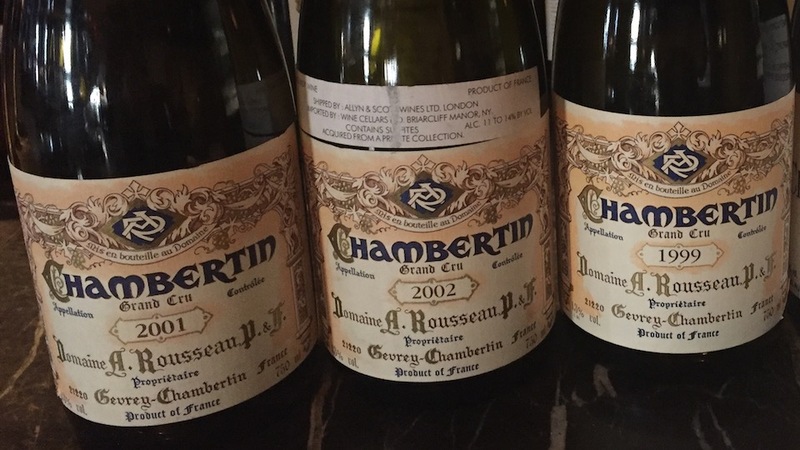 Rousseau's 1995 Chambertin is bright, precise and wonderfully nuanced. There is a sense of translucent brilliance to the 1995 that is simply compelling. Sweet red berry fruit and floral notes show striking energy throughout. What a lovely Burgundy this is. I have always adored Rousseau's 1993 Chambertin. Tonight is no exception. Beams of supporting tannin give the 1993 its explosive power and overall shape. Virile and intense in every direction, with tons of fruit and overall structure, the 1993 is simply magnificent. Time in the glass brings out the wine's inner perfume and sweetness. Readers lucky enough to own the 1993 can look forward to another 20+ years of thrilling drinking. One of the highlights in this vertical, the 1991 Chambertin is simply stratospheric. Dense and powerful, with a huge center of fruit and exceptional balance, the 1991 is wonderfully complete from start to finish. The flavors are shrouded in darkness, and yet there is more than enough aromatic lift, sweetness and freshness to balance its more sepia-toned leanings. This is another wine with a good 20 years of profound drinking ahead of it. The 1990 Chambertin appears to be at an early plateau of maturity where the tannins have softened and the flavors are starting to show signs of dried stone fruit, leather, tobacco and spice overtones. There is lovely silkiness and nuance throughout, but less of the visceral thrill that is found in many other wines in this tasting. I would prefer to drink the 1990 sooner rather than later. This is a gorgeous bottle of the 1989 Chambertin. Sweet, perfumed and silky on the palate, the 1989 is all finesse. Aeration helps blow off a touch of reduction, after which the 1989 shows off its refined personality to great effect. I find lovely precision and nuance laced throughout. This bottle has a bit more fruit and mid-palate depth than other recent examples have shown. The 1988 Chambertin is powerful and burly, but it also lacks the fruit density of the other wines in this tasting that share its virile personality. Hints of tobacco, smoke and leather add shades of complexity. I suspect the 1988 will drink well for another 15+ years, even if it will probably never reach the heights of some of the more profound vintages. I have had better examples of the 1988.